Since loads of people refuse to abandon Windows Media Player but are still having problems with their subtitles, I figured I would make this guide to help you out. I have helped friends and family plenty of times by using the methods I will detail later but know that they might not always work. Note that I will be using Windows Media Player 12 for this guide, included in Windows 7 and later. If you are running an earlier version, your experience might vary. The first things you will need for this is a video file and a subtitle one. Finding a subtitle might be tricky but there are plenty of websites out there that a quick Google search will reveal. Do try to stay away from any site that seems malicious and you should be okay. The easiest thing you can do is to rename the video and subtitles files with the exact same name. Look at the screenshot above as an example. I have named both the video and the subtitle file “Hannibal 2001” so when I start it with Windows Media Player, the program automatically retrieves both files. This will work in some cases but it is definitely not a guarantee. Since it only takes a few seconds though, it is worth it. You can even select both files and rename them simultaneously to be even quicker. You might also get results by renaming the subtitle file’s extension to .sub from the much more common .srt. This add-on has a long development history and should prove to be very useful for our cause. Go here and download the installer. Run it and you are pretty much done. 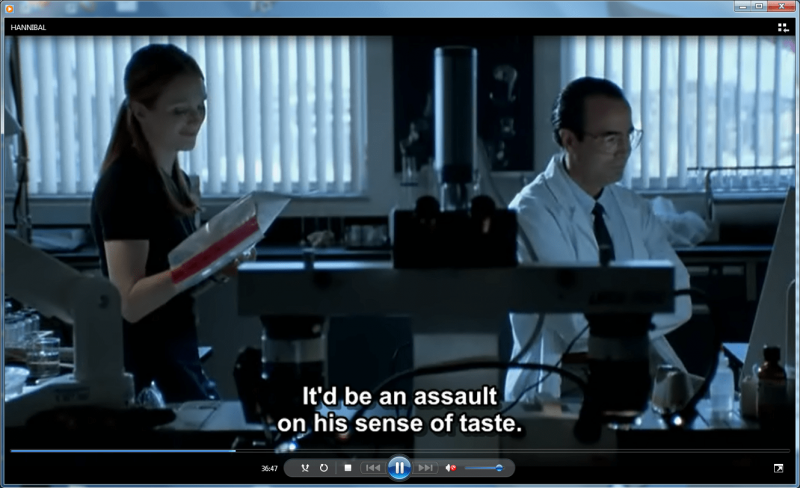 Windows Media Player should now recognize external subtitles without you having to do anything else. The little app can provide a lot more functionality than that but this is the only thing you need from here. If everything else fails, consider the effort you have put through and whether Windows Media Player is right for you. You could always simply download a media player with full support for subtitles without the need of add-ons.